In the world of pastry, there are some who live to create and plate, and there are others who are happiest with their heads down, deep in the throes of production. Colin Kull says he’s normally the latter. “I love being able to make 200 of something amazingly perfect,” says the chef, who was trained in the Tartine Bakery kitchen, where only the best-looking items make it to the pastry case. 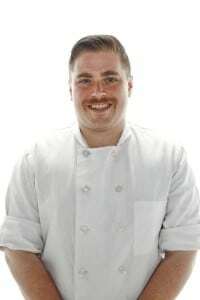 But Kull’s star has most recently risen at Range, where he heads up the dessert program alongside chef-owner Phil West. In the small Mission restaurant, Kull concentrates on a short menu of composed, seasonal finales that are a fun departure from his past work. Not to mention a more demanding schedule. “The 15-hour days don’t even phase me anymore,” says Kull, who lives close by in Bernal Heights with his partner. Kull isn’t the guy who always knew he wanted to be in pastry, although the Oregon native got a job as dishwasher at a bakery when he was 16 and was a night-shift baker while a photography and art history student at the University of Oregon. It wasn’t until he was offered a head pastry chef job at another bakery — and followed that with a year doing butchery at an Italian agritourismo — that he realized his future was in the culinary world. Shortly thereafter, he picked up and moved to the Bay Area. He set his sights on Tartine, and landed a job there in a month. While there, Kull helped develop recipes for “Tartine Book No. 3,” where owner Chad Robertson recreated classic Tartine recipes using alternative grains. It’s this style that has influenced Kull’s desserts at Range, and his recipe for buckwheat profiteroles, which he serves with tart Greek frozen yogurt, black sesame brittle and roasted strawberries. He’s drawn to dishes that balance sweet and savory — “You know, the ones where people think it’s going to be a sugar bomb, but then it’s not,” he says. Of course, he also makes sure those desserts look pretty perfect. It’s what he knows best.